Zaida Lavinnia Holcombe was born on 14 May 1873 at Henrietta, Monroe Co., NY. She was the daughter of Watson Dewey Holcombe and Lavinnia Jones. Zaida Lavinnia Holcombe died on 1 September 1873 at Henrietta, Monroe Co., NY. Dentist, Rochester, NY. Roy Jones Holcombe DDS was born on 8 July 1874 at Henrietta, Monroe Co., NY. He was the son of Watson Dewey Holcombe and Lavinnia Jones. Roy Jones Holcombe DDS died on 4 March 1923 at age 48. He was buried at Maplewood Cemetery, Henrietta, Monroe Co., NY. [S25] Hannah McPherson, Holcombe Genealogy, Page 112.2/Item A-8-1-1-9-1-2-3-4-3. McPherson shows the birth date to be October 3, but family records show August 3. Cora Samantha Holcombe was born on 3 August 1877 at Henrietta, Monroe Co., NY. She was the daughter of Watson Dewey Holcombe and Lavinnia Jones. Cora Samantha Holcombe was buried at Maplewood Cemetery, Henrietta, Monroe Co., NY. She died on 18 November 1964 at Rochester, Monroe Co., NY, at age 87. Chester Frank Holcombe was born on 20 March 1880 at Henrietta, Monroe Co., NY. He was the son of Watson Dewey Holcombe and Lavinnia Jones. Chester Frank Holcombe married Grace Sowerley on 10 June 1903 at Rochester, Monroe Co., NY. Chester Frank Holcombe married Louise Shelby, daughter of Dr. Philemon Richard Shelby and Pauline McGehee, on 25 December 1912 at Rochester, Monroe Co., NY; A second source indicates the marriage may have been in Princeton, KY. Chester Frank Holcombe died on 24 April 1958 at Rochester, Monroe Co., NY, at age 78. He was buried at Maplewood Cemetery, Henrietta, Monroe Co., NY. He was president of the Avon, NY, Knitting Mills, later a tobacco dealer. Lived at 28 E. Main St., Avon, NY, a suburb of Rochester. [S25] Hannah McPherson, Holcombe Genealogy, Page 112.2/Item A-8-1-1-9-1-2-3-4-5. [S23] Jesse Seaver, The Holcomb(e) Genealogy, Page 77. Carrie Irene Holcombe was born on 1 August 1887 at Henrietta, Monroe Co., NY. She was the daughter of Watson Dewey Holcombe and Lavinnia Jones. Carrie Irene Holcombe married Benjamin Franklin Clark DDS on 30 June 1910 at Henrietta, Monroe Co., NY. Carrie Irene Holcombe died on 10 December 1963 at age 76. She was buried at Maplewood Cemetery, Henrietta, Monroe Co., NY. [S25] Hannah McPherson, Holcombe Genealogy, Page 112.2/Item A-8-1-1-9-1-2-3-4-6. Grace Sowerley married Chester Frank Holcombe, son of Watson Dewey Holcombe and Lavinnia Jones, on 10 June 1903 at Rochester, Monroe Co., NY. Grace Sowerley died in 1908. Louise, from Princeton, KY, studied 5 years at the National Park College, Forest Glen, Washington, DC. Louise Shelby was born on 31 May 1889 at Princeton, KY. She was the daughter of Dr. Philemon Richard Shelby and Pauline McGehee. Louise Shelby married Chester Frank Holcombe, son of Watson Dewey Holcombe and Lavinnia Jones, on 25 December 1912 at Rochester, Monroe Co., NY; A second source indicates the marriage may have been in Princeton, KY. Louise Shelby died on 24 March 1985 at Santa Barbara, Santa Barbara Co, CA, at age 95. Graduated from Syracuse University, NY; worked as newspaper reporter at age 14 years, editor at 17, in world travel (encircling the globe); visited 5 continents and 14 countries as newspaper man, radio commentator, lecturer, before the mast, big game hunting; was under fire in Chinese war, being in the midst of swift moving events in China and Japan from 1939-1942; served with Federal Communications Commission, Washington, DC; spent 1 year in Tokyo in US Naval Reserve, assigned to further study of reading and writing the Japanese language, which he spoke; stationed at Navy School in University of Colorado. He worked for thirty four years at the Santa Barbara News-Press as a reporter, but left his mark on Santa Barbara also as a frequent speaker at club meetings, as a morning radio commentator on KTMS an as Santa Claus in the annual downtown christmas parade. [S25] Hannah McPherson, Holcombe Genealogy, Page 112.2/Item A-8-1-1-9-1-2-3-4-5-1. [S25] Hannah McPherson, Holcombe Genealogy, Page 112.1.Item A-8-1-1-8-1-2-3-4-5-2. Ada Elizabeth Slaughter was born Friday, February 13, 1920 at Los Angeles, Los Angeles Co., CA. She was the daughter of Samuel McTeer Slaughter and Mary Helen Mills. Ada Elizabeth Slaughter married Chester Shelby Holcombe, son of Chester Frank Holcombe and Louise Shelby, on 25 June 1942 at Los Angeles, Los Angeles Co., CA. Benjamin Franklin Clark DDS married Carrie Irene Holcombe, daughter of Watson Dewey Holcombe and Lavinnia Jones, on 30 June 1910 at Henrietta, Monroe Co., NY. [S25] Hannah McPherson, Holcombe Genealogy, Page 112.2/Item A-8-1-1-9-1-2-3-4-6-1. Cora Lucile Clark was born on 23 January 1915 at Rochester, Monroe Co., NY. She was the daughter of Benjamin Franklin Clark DDS and Carrie Irene Holcombe. Cora Lucile Clark died on 15 June 1926 at Rochester, Monroe Co., NY, at age 11. She was buried at Maplewood Cemetery, Henrietta, Monroe Co., NY. [S25] Hannah McPherson, Holcombe Genealogy, Page 112.2/Item A-8-1-1-9-1-2-3-4-6-3. Fannie Frost White married Harvey Judson Holcombe, son of Alonzo Holcombe and Lois Stone, on 25 February 1880 at West Brighton, NY. Warren Holcombe was born on 10 October 1881 at Henrietta, Monroe Co., NY. He was the son of Harvey Judson Holcombe and Fannie Frost White. Warren Holcombe died on 18 March 1897 at Henrietta, Monroe Co., NY, at age 15. He was buried at Mt. Hope Cemetery, Rochester, Monroe Co., NY. Alonzo Barton Holcombe II was born on 8 September 1885 at Henrietta, Monroe Co., NY. He was the son of Harvey Judson Holcombe and Fannie Frost White. Alonzo Barton Holcombe II died on 31 May 1978 at Rochester, Monroe Co., NY, at age 92. He was buried at Mr. Hope Cemetery, Rochester, Monroe Co., NY. Harry and Florence were enumerated in the 1930 Rochester, Monroe Co., NY, federal census, District 96. 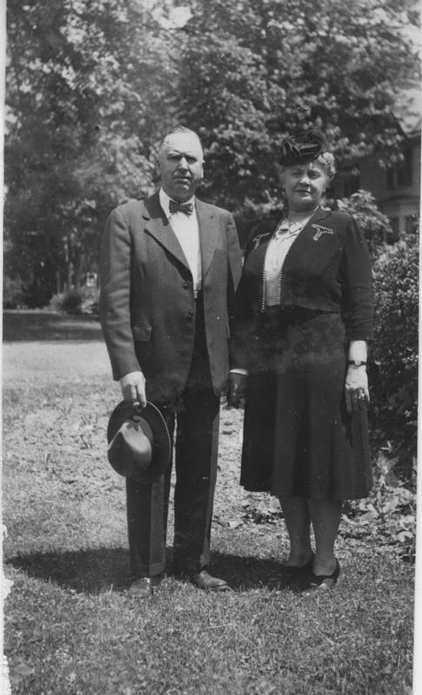 Also in the household were brother Barton and Cora Holcombe. [S25] Hannah McPherson, Holcombe Genealogy, Page 112.2/Item A-8-1-1-9-1-2-3-5-3. [S182] Social Security Death Index (on-line), Ancestry.com, SSDI, Ancestry.com, SSAN 073-10-8457. Florence L. Evans was born in 1890. She married Harry Judson Holcombe, son of Harvey Judson Holcombe and Fannie Frost White, on 12 June 1928 at Rochester, Monroe Co., NY. Florence L. Evans died on 7 February 1965. Another source has her as Florence Lockman, perhaps Evans is married name. Harry Judson Holcombe II was born on 29 October 1930 at Rochester, Monroe Co., NY. He was the son of Harry Judson Holcombe and Florence L. Evans. Harry Judson Holcombe II died in June 2004 at age 73. Gillett Kendall was born on 2 June 1787. She was the daughter of Noadiah Kendall and Ruth Gillet. Gillett Kendall married Amassa Holcombe II, son of Elijah Holcombe and Lucy Holcombe, on 10 November 1808 at Granby, Hartford Co., CT.1 Gillett Kendall died on 2 February 1861 at age 73. Sophia Holcombe was born on 10 September 1810 at Southwick, Hampden Co., MA. She was the daughter of Amassa Holcombe II and Gillett Kendall. [S25] Hannah McPherson, Holcombe Genealogy, Page 113.2/Item A-8-1-1-9-1-3-1. Milton Holcombe was born on 4 October 1812 at Southwick, Hampden Co., MA. He was the son of Amassa Holcombe II and Gillett Kendall. Milton Holcombe married Elvira Gillett, daughter of Moses Gillett, on 15 August 1834. Milton Holcombe died on 7 November 1886 at Southwick, Hampden Co., MA, at age 74. Milton was a farmer on his father's farm, Southwick, MA; served as a town Selectman. Milton was enumerated in the Southwick, Hampden Co., MA, federal census. He was enumerated next to his father. There were two male children in the household. Milton and Eliza were enumerated in the 1850 Southwick, Hampden Co., MA, census, page 3. Chauncey, Emma, Alfred, Birney, and Wallace were in the household. Milton and Elvira were enumerated in the 1860 Southwick, Hampden Co., MA, federal census. He was a farmer age 47, she was 48. Children in teh household were Chauncey 21, Emma 19, Alfred 17, Birney 15, Wallace 13, and Mary E. 5. Milton and Elvira were enumerated in the 1870 Southwick, Hampden Co., MA, federal census. He was a farmer age 58, she was 58. Children in the household were Burney 25, Wallace 24, and Mary 15. Milton and Alvira were enumerated in the 1880 Southwick, Hampden Co., MA, federal census (NA film T9-0534, page 155A). He was a farmer age 67, she was 68. Children in the household were daughter-in-law Ellen E. 30, and her two children Bessie 5, and Grace 3. [S25] Hannah McPherson, Holcombe Genealogy, Page 113.2/Item A-8-1-1-9-1-3-2. Candace Holcombe was born on 26 August 1815 at Southwick, Hampden Co., MA. She was the daughter of Amassa Holcombe II and Gillett Kendall. Candace Holcombe died on 22 September 1818 at age 3. Associated with his father in the manufacture of telescopes. Alfred Holcombe was born on 2 May 1818 at Southwick, Hampden Co., MA. He was the son of Amassa Holcombe II and Gillett Kendall. Alfred Holcombe died on 8 October 1843 at age 25. [S25] Hannah McPherson, Holcombe Genealogy, Page 114.1/Item A-8-1-1-9-1-3-4. Candace Holcombe was born on 22 July 1820 at Southwick, Hampden Co., MA. She was the daughter of Amassa Holcombe II and Gillett Kendall. [S25] Hannah McPherson, Holcombe Genealogy, Page 114.2/Item A-8-1-1-9-1-3-5. Henry Holcombe was born on 5 March 1823 at Southwick, Hampden Co., MA. He was the son of Amassa Holcombe II and Gillett Kendall. Henry Holcombe married Keturah Dibble, daughter of Reuben W. Dibble and Hulda Adams, on 27 March 1843. Henry was recorded in teh 1850 census of Southwick, Hampden Co., MA, as a farmer. [S25] Hannah McPherson, Holcombe Genealogy, Page 114.2/Item A-8-1-1-9-1-3-6. Amanda Holcombe was born on 29 May 1825. She was the daughter of Amassa Holcombe II and Gillett Kendall. Amanda Holcombe died on 3 January 1844 at age 18. Franklin Holcombe was born on 22 September 1827 at Southwick, Hampden Co., MA. He was the son of Amassa Holcombe II and Gillett Kendall. Franklin Holcombe married Mary E. Gibbons, daughter of James Gibbons and Philura (? ), on 27 November 1851 at Southwick, Hampden Co., MA. Franklin Holcombe married Eliza Gibbons, daughter of James Gibbons and Philura (?). Franklin Holcombe married Sarah Jane Robinson. Franklin Holcombe died on 6 December 1861 at Military Hospital, Annapolis, MD, at age 34. Franklin is recorded in the 1850 census of Southwick, Hampden Co., MA, as the only child then remaining at home with his parents. He was a union soldier serving in Co. F., 27th Mass. Regt. [S25] Hannah McPherson, Holcombe Genealogy, Page 114.2/Item A-8-1-1-9-1-3-8. Elvira Gillett was born on 22 January 1812 at MA. She was the daughter of Moses Gillett. Elvira Gillett married Milton Holcombe, son of Amassa Holcombe II and Gillett Kendall, on 15 August 1834. Elvira Gillett died on 7 November 1886 at age 74. Emma C. Holcombe was born on 25 March 1835 at Southwick, Hampden Co., MA. She was the daughter of Milton Holcombe and Elvira Gillett. Emma C. Holcombe died in 1839. Emerett Holcombe was born on 27 June 1837 at Southwick, Hampden Co., MA. She was the daughter of Milton Holcombe and Elvira Gillett. Enlisted in the Union Army, Co. F. 27th Mass. Regt an died in Libby prison. Chauncey Holcombe was born on 20 September 1838 at Southwick, Hampden Co., MA. He was the son of Milton Holcombe and Elvira Gillett. Chauncey Holcombe died on 6 June 1864 at Libby Confederate Prison at age 25. [S25] Hannah McPherson, Holcombe Genealogy, page 113.2/Item A-8-1-1-9-1-3-2-3. Emma Holcombe was born on 1 December 1840 at Southwick, Hampden Co., MA. She was the daughter of Milton Holcombe and Elvira Gillett. Emma Holcombe married Simeon Palmer, son of Leman Palmer and Salome Root, on 29 April 1869. [S25] Hannah McPherson, Holcombe Genealogy, Page 114/Item A-8-1-1-9-1-3-2-4. Alfred enlisted in F. 27th Mas Regt. Union Army and was wounded in service. Alfred Holcombe was born on 5 May 1843 at Southwick, Hampden Co., MA. He was the son of Milton Holcombe and Elvira Gillett. Alfred Holcombe married Ellen Elvira Baker on 29 June 1869. Alfred Holcombe died in 1878. [S25] Hannah McPherson, Holcombe Genealogy, Page 114.1/Item A-8-1-1-9-1-3-2-5. Farmer, tobacco, hay and grain, and fruit, apples, pears, peaches and grapes, on his 225 acres farm, Granby, CT (Southwick, MA) where he served as steward and trustee of Methodist Episcopal Church. Birney G. Holcombe was born on 30 November 1844 at Southwick, Hampden Co., MA. He was the son of Milton Holcombe and Elvira Gillett. Birney G. Holcombe married Mary L. Palmer, daughter of Leman Palmer and Salome Root, on 5 June 1870. Birney G. Holcombe died on 26 May 1918 at age 73. [S25] Hannah McPherson, Holcombe Genealogy, Page 114.1/Item A-8-1-1-9-1-3-2-6. Wallace Holcombe was born on 15 July 1846 at Southwick, Hampden Co., MA. He was the son of Milton Holcombe and Elvira Gillett. Wallace Holcombe married Ellen L. Butler, daughter of Burrage Yale Butler and Maria Louisa Forward, on 6 April 1875. Wallace Holcombe lived in 1917 at 300 Main St., Suffield, CT.
Wallace taught at Southwick, MA, where he lived on his father's homestead 10 years prior to Nov 1885 when he moved with his family to 1000 acres sheep ranch near Godfrey, CO, 75 miles east of Denver; disposed of the ranch and 1000 sheep in 1887 and moved to Castle Rock, Co where he established and operated a creamery; then engaged in hardware, lumber and coal business until 1903; served there as Supt. of Sunday School, Justice of the Peace and Mayor; moved to Colorado Springs Co; became joint owner and President of an electric plant at Steamboat Springs; returned 1907 and bought home and acreage, Ashley Ave., W. Springfield, MA, where he lived until he sold it in April 1917 and moved to Suffield, CT; collected and arranged genealogical information on 3000 of descendants of his immigrant ancestor, Thomas Holcombe. So Hannah's information on his family is probably pretty reliable and also that of his wife. Wallace and Ellen were enumerated living on Main St. in the 1920 Suffield, Hartford Co., CT, federal census, ED 192, page 5B. "Violet" age 35 and sister Mary Osborne were also in the household. Wallace and Nellie B. were enumerated in the 1930 Suffield, Hartford Co., CT, federal census, district 219. He was 83, she was 87. [S25] Hannah McPherson, Holcombe Genealogy, Page 114.1/Item A-8-1-1-9-1-3-2-7. Mary Elizabeth Holcombe was born on 8 May 1855 at Southwick, Hampden Co., MA. She was the daughter of Milton Holcombe and Elvira Gillett. [S25] Hannah McPherson, Holcombe Genealogy, Page 114.1/Item A-8-1-1-9-1-3-2-8. Ellen Elvira Baker was born in May 1849 at VT.1 She married Alfred Holcombe, son of Milton Holcombe and Elvira Gillett, on 29 June 1869. Ellen Elvira Baker died on 15 November 1919 at age 70. Bessie Gertrude Holcombe was born on 28 March 1874 at Greenfield, Franklin Co., MA. She was the daughter of Alfred Holcombe and Ellen Elvira Baker. Bessie Gertrude Holcombe died on 4 November 1953 at Hartford Hospital, Hartford, Hartford Co., CT, at age 79. She was buried at Southwick Cemetery, Southwick, Hampden Co., MA. Bessie was enumerated as the head of household in the 1930 Hartford, Hartford Co., CT, federal census, district 69. She was 55 and single, a buyer at a department store; her sister Grace M, 52, was a registrar at a Doctors' office. An aunt, Minnie E. Park, 75, was also in the household. An obituary in the Courant indicated that Bessie had never married, had lived in Hartford for 77 years, that she was a buyer at Sage-Allens for nearly 50 years, and had no close relatives.